Distinguished defense policy adviser Michael Pillsbury writes his bestselling book The Hundred-Year Marathon: China's Secret Strategy to Replace America as the Global Superpower. In this book, Pillsbury writes about the past four decades that the United States has spent playing an indispensable role in helping China build their booming economy, develop their military and scientific capabilities, and finally take its place on the world stage. The United States government did this in the belief that China's rise in the global stage will bring the world diplomacy, cooperation, and free trade. Pillsbury poses this question: “What if the ‘China Dream’ is to replace us, just as America replaced the British Empire, without firing a shot?” His book The Hundred-Year Marathon is an alarming wake-up call as the United States faces the greatest national security challenge of our time. In this comprehensive look into The Hundred-Year Marathon: China's Secret Strategy to Replace America as the Global Superpower by Michael Pillsbury, you'll gain insight with this essential resource as a guide to aid your discussions. Be prepared to lead with the following: Discussion aid which includes a wealth of prompts and information Overall plot synopsis and author biography Thought-provoking discussion questions for a deeper examination Creative exercises to foster alternate “if this was you” discussions And more! 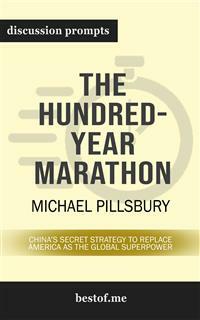 Disclaimer: This is a companion guide based on the work The Hundred-Year Marathon: China's Secret Strategy to Replace America as the Global Superpower by Michael Pillsbury and is not affiliated to the original work or author in any way. It does not contain any text of the original work. If you haven’t purchased the original work, we encourage you to do so first. Have you ever wanted to improve your understanding of The Hundred-Year Marathon? Or perhaps you are simply struggling to learn the subject matter? It’s a simple teaching technique that helps students learn and readers to grow. With versatile discussion questions for each major criteria regarding The Hundred-Year Marathon, these discussion prompts are designed to help surface crucial discussions that are capable to assist toward thinking and learning on a deeper level.